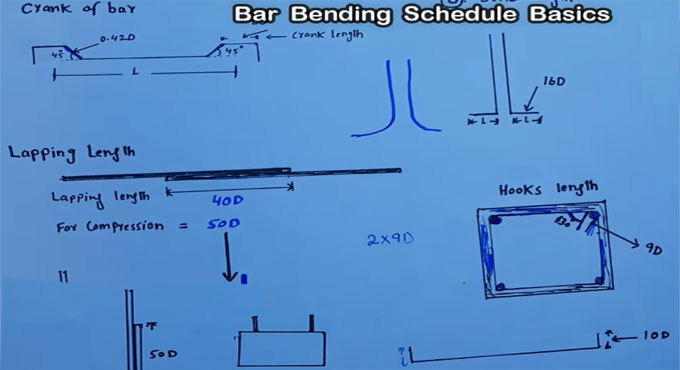 In this Video, detailed information is provided on the basics formulas of bar bending schedule. You will get some useful tips to create and determine the steel cutting length. In Civil Engineering Bar Bending Schedule is one of the most vital parts of the estimation chart. Bar bending schedule offers the reinforcement calculation for reinforced concrete column, beam and slab. It comes up with the details of reinforcement cutting length, type of bends and bend length which are found in steel structures. BBS is useful for determining the cutting length of steel and total weight of steel per unit area. The bar bending schedule is created in MS Excel software. Crank Length = 0.42D, where D denotes dia of steel that is utilized in the beam. Here, there are two types of lapping i.e. Tension member and Compression member.